One board, one year’s worth of activities! Rapid Recall Whiteboards have been designed by teachers to promote discussion, maintain fluency and develop mastery in primary maths. 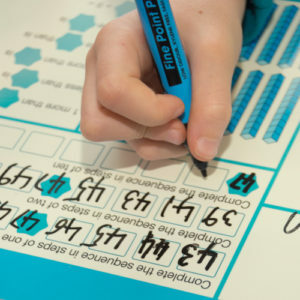 The double-sided, A3 drywipe boards cover key National Curriculum Number objectives for each year group, while still revising the previous years’ concepts. Simply change the starting number on your whiteboard to change the challenge! 1) In the top left corner of the board, you will see a symbol which varies according to the side of the board and year group. 2) Within this symbol write the chosen number – selected from the range stated below the shape. 3) Now complete the board and use the symbol as the chosen number – like algebra! 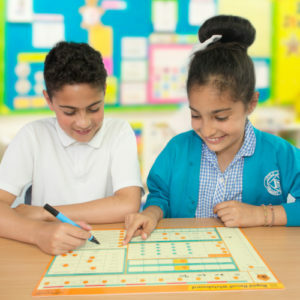 4) Once the board is completed, using the supplied answers, the pupil can either self-mark or get a peer, teaching assistant or teacher to mark the board. What do you get when you buy Rapid Recall Whiteboards? Make marking easy with the Rapid Recall Whiteboard Online Answers Portal. The board will populate itself with the correct answers! You can show the answers on the interactive whiteboard for the whole class to see and mark or use them on a tablet during smaller group sessions and for self and peer marking. 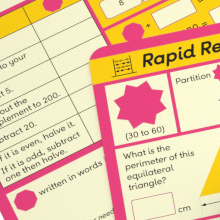 Our Rapid Recall handbook contains everything you need to carry out your own evaluation project with the boards, or just make the most of using the boards in your classroom. The handbook contains suggestions of ways to use and mark the boards, mastery activities, tracking grids, ways to measure progress, certificates for children, ‘38 Ways to Master Maths with the Rapid Recall Whiteboards’ and much more. Be inspired with this A3, double-sided ideas poster. You’ll find ideas for using and marking the boards, as well as guidance for making the most out of them. Why not put the poster up in your classroom and have children pick which way they’d like to use the boards today? Sense of Number CPD trainer, Anthony Reddy, loves using the Rapid Recall Whiteboards in his training and we love his take on them. You can watch his training sessions on each side of each board to make sure that you and your colleagues are best-practice ready when using the boards. We’ve also created some presentations for you to train staff on getting the best out of your boards. There’s no set way to use the Rapid Recall Whiteboards, and we love to hear of the new ways that classes are using them. Some of our favourites include the ‘Pilot and Navigator’, the ‘Silent Assassin’, and the ‘Timed Snapshot’. These quick videos should give you an idea of how you can use these methods, and more, with your class. To save you trying to work out which National Curriculum Objective fits with each area of the board, we’ve done it for you. Each board has a simple sheet so you know exactly what you’re covering.